Click on the Accounts tab to view your managed accounts. Include archived accounts - Select this check box to include accounts that have been archived in the table. Account type - Use the drop-down menu to filter by account types. The items in the drop-down are highlighted with the corresponding color for that account type. Download CSV - Click this button to download the currently displayed account data to a CSV. Column View Settings - Click this button to select which columns are displayed on the table, then click Apply to save your changes. This column selection is saved in your local browser storage and will remain between login sessions. Organization - Displays the organization name for the account. Account Type - Displays the type of account. Trial accounts are highlighted in orange and free accounts are highlighted in yellow. Date Created - Displays the date the account was created. End Date - Displays the date the subscription ends. For trial accounts, it shows the trial expiration date. This column is hidden by default. Seats - Displays the number of licensed seats allotted to the account. Users - Displays the number of active users on the account. Courses - Displays the number of courses added to an account. This column is hidden by default. Risk Score - Displays the most recent risk score for the account. See here for more information on how risk scores are calculated. Phish-prone % - Displays the most recent campaign's Phish-prone Percentage for the account. See here for more information on how Phish-prone Percentage is calculated. PSTs - Displays the number of Phishing Security Tests performed on the account. % Users Phished - Displays the percentage of users who have been phished. This is calculated by dividing the number of users phished by the number of total users on the account. This percentage is refreshed daily but you can manually refresh the data from the Account Actions drop-down menu by clicking Refresh Percentages. % Users Trained - Displays the percentage of users who have completed a training/video module or game. This is calculated by dividing the number of users who have completed a training/video module or game by the number of total users on the account. This percentage is refreshed daily but you can manually refresh the data from the Account Actions drop-down menu by clicking Refresh Percentages. Account Actions - Click the arrow to show more options. From here, you can Archive or Restore the account, reset the free Phishing Security Test (PST) with Reset PST or reset the USB Security Test (UST) with Reset UST for applicable accounts, and manually refresh the users phished and users trained percentages by clicking the Refresh Percentages button. View Account as Admin - Click this button to log in to the account as the admin in a new tab. You can use this tab to create new accounts, archive accounts, and manage your accounts. + New Account - Click here to add new accounts. Organization - Click on the name of any of your managed accounts to manage the account individually. archive - Click here to archive the managed account. Click on the account name to access a managed account. From here, you can edit the account's info, turn on MFA for the account, or log in to the account by clicking View as Admin. Alternatively, you can select the View Account as Admin button next to the account name on the Managed Accounts tab. View as Admin - Click here to view the managed account as an admin. Edit Account Info - Here you can modify the Account Settings that you initially set up for your managed account, including the services they have access to and their account information. 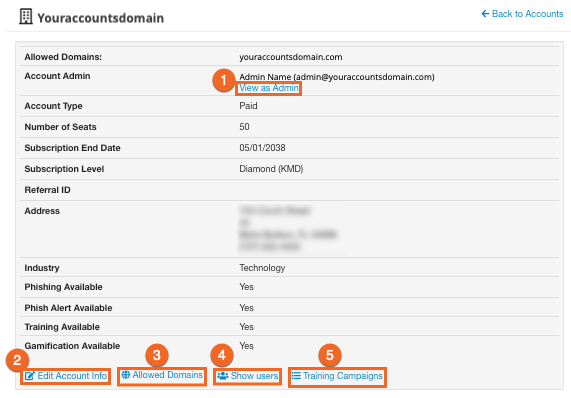 Allowed Domains - If your managed account has multiple domains associated with their organization, you can add those additional domains to their account by clicking on Allowed Domains. 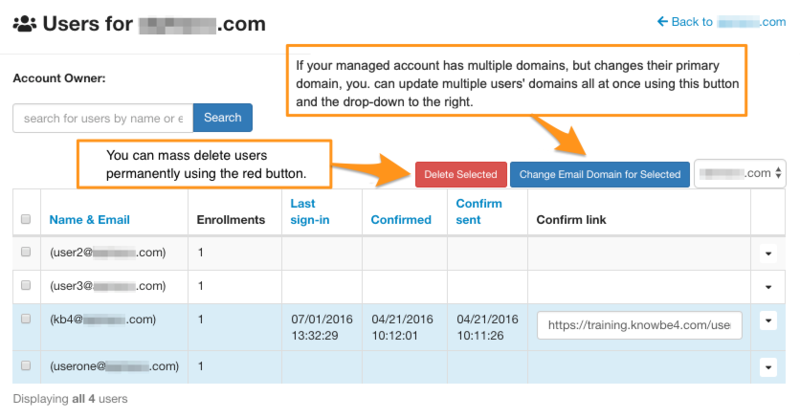 Show Users (click to view) - Here you can permanently delete users from your managed account's console, as well as change the primary domain of the users in the console. For instance, if your managed account has the domain "DomainA.com" and they then change their primary domain to "DomainB.com" you can change their users' email addresses by selecting the affected users from the Show Users screen and clicking the Change Email Domain for Selected button. Training Campaigns - Here, you can view a list of your managed account's training campaigns. The list will be sorted by start date and include the status of the training campaign. From this screen, you have the option to remove a training campaign by clicking the Permanently Delete Selected button.